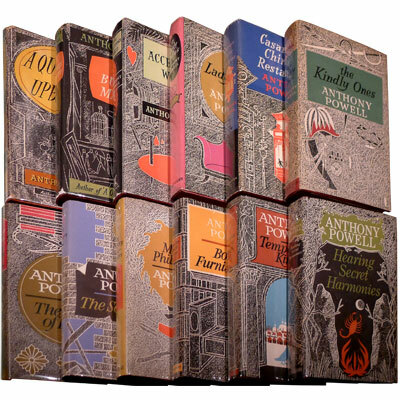 A bright and complete twelve volume set of Anthony Powell’s dodecahedral masterpiece 'A Dance to the Music of Time' . ‘This twelve-volume sequence ‘A Dance to the Music of Time’ traces a colourful group of English acquaintances across a span of many years from 1914 to 1971. The slowly developing narrative centres around life's poignant encounters between friends and lovers who later drift apart and yet keep reencountering each other over numerous unfolding decades as they move through the vicissitudes of marriage, work, ageing, and ultimately death. Until the last three volumes, the next standard excitements of old-fashioned plots (What will happen next? Will x marry y? Will y murder z?) seem far less important than time's slow reshuffling of friends, acquaintances, and lovers in intricate human arabesques’ - Robert L Selig; Time and Anthony Powell, A Critical Study.